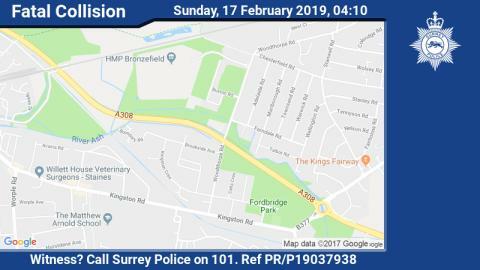 The collision occurred at approximately 4.10am today (Feb 17) when a woman in her early 20s was involved in a collision with a red Renault Scenic on the Staines-bound carriageway of the A308. She was pronounced dead at the scene and her next of kin has been informed. The collision occurred near to the A308 bridge over Woodthorpe Road. The road is likely to remain closed for another hour between the Fordingbridge Roundabout and Crooked Billet Roundabout. Officers are appealing for anyone who saw the movements of the woman or the Renault Scenic before the collision, or for anyone who may have any dashcam footage to come forward. If you have any information you should contact Surrey Police on 101 or tell us online via or http://surrey.police.uk/TellUsMore, quoting reference PR/P19037938.